For the cake. Preheat oven to 350 and line two 9″ cake pans with parchment and either butter or spray them then set aside. Lightly mix together the cake mix and pudding mix then in a separate bowl mix your eggs water, oil (or butter) and vanilla well, until all the eggs are incorporated. Add the wet mixture into the cake mix making sure to mix it thoroughly for a few minutes, and then add the sour cream blending until no white streaks remain. Last add the chocolate chips and just fold them in with a spatula so they are evenly distributed. The batter is quite thick, but it bakes up really nice so don’t be nervous about the texture. Pour evenly into your cake pans and level out with a spatula. Bake for about 22-25 minutes checking for doneness with a toothpick. The top of the cakes spring back when done and the cake just barely starts to pull from the sides of the pan. Let cool in pans for 5 minutes then turn out onto a cooling rack to cool completely while you make your frosting and ganache. Next I make the ganache and then the frosting because you need to pipe frosting around the bottom of your layer cake in order to hold the ganache in the middle while it cools. The ganache can start to cool down and thicken while you make the frosting. For the ganache: Put the chocolate and heavy cream in a heatproof bowl – I use 4 cup pyrex for this. Heat slowly in the microwave either on defrost or in 20 second intervals at full power until the chocolate starts to loose it’s shape and you can whisk it smooth. You can also heat the chocolate and cream in a double boiler, but I find the microwave method much easier. For the frosting: In a large bowl with an electric mixer, beat the cream cheese and butter until light and fluffy. Gradually add the confectioners’ sugar 1 cup at a time, mixing thoroughly after each addition and scraping down the sides of the bowl often. Continue to beat on medium speed until light and fluffy, 3 to 4 minutes. Add the peanut butter and beat until thoroughly blended. 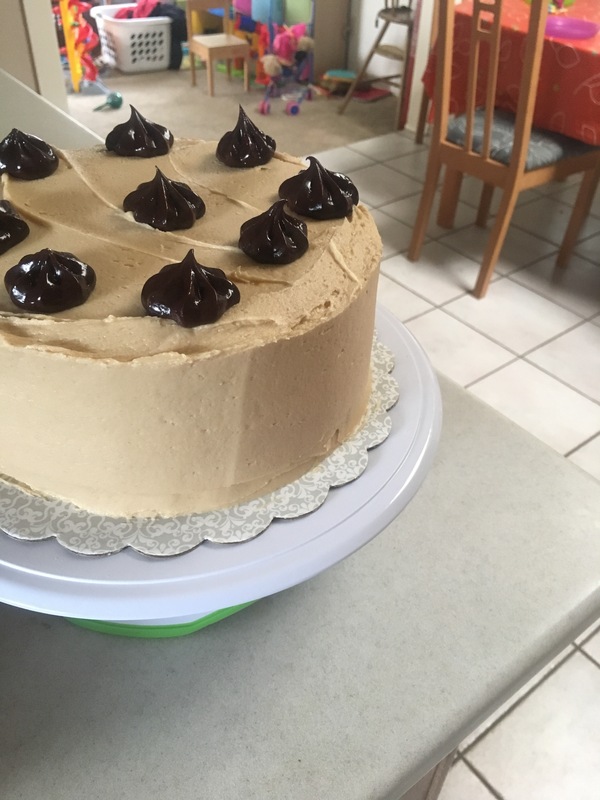 Once the cakes have cooled, level the tops with a long serrated knife, unless you don’t care about having a neat looking cake, but this makes frosting easier and it gives you a little snack while you work. Put the first layer on a plate or cake board and pipe with either a piping bag or just a bag made from parchment a dam of frosting around the diameter of the bottom layer that will hold in your ganache when you pour it in. You may have some extra ganache – I used it last time to put on the top of my cake which you can do, or just save it for something else. Now take your ganache and pour it into the middle of that bottom layer spreading out but taking care not to let it go over the edge or over the edge of your frosting layer – this is why you made a frosting dam, to hold in your ganache and keep your second layer of cake from squishing it. Let that cool for 10 minutes or so then put the second cake layer on – neat side up and plop a large amount of frosting on top. Using an offset spatula spread the peanut butter frosting taking care to only touch your spatula to the frosting, and not to the cake so you don’t drag crumbs. Work your frosting around the top, pushing it slowly from the middle, and then around the sides scraping the extra into a paper towel so you don’t drag crumbs. A spinning cake pedestal helps, but you can do this by just turning a plate. 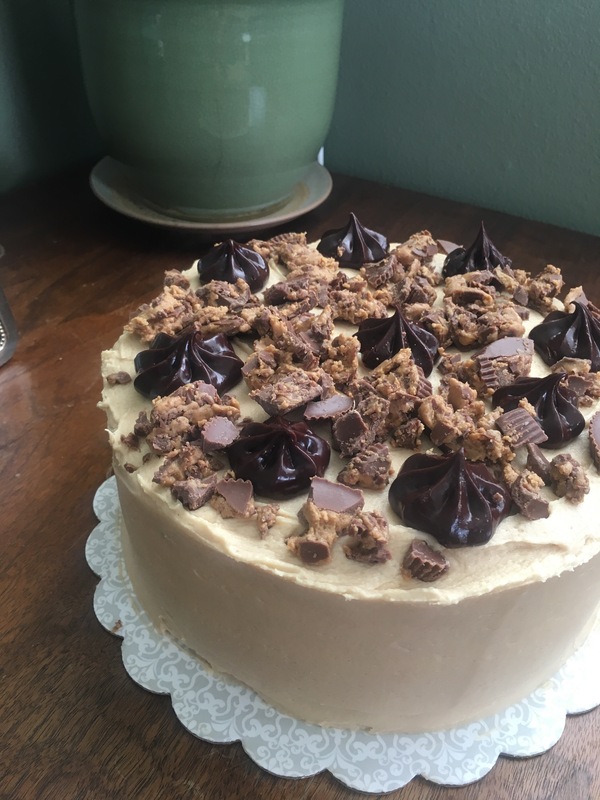 Once you have a uniform and neat cake you can decorate with extra ganache, chocolate curls, Reeses Peanut Butter Cups or whatever you would like. Keep plastic where you’ve cut your cake so it doesn’t dry out, but you’re not likely to have any extra! Winter brings out my love of comfort food. I just want to consume classic, easy, basic foods. I have been thinking about Pineapple Upside-Down cake for a while now because of that delicate caramelized layer of brown sugar and butter and fruit. I researched a lot of options and landed on this divine recipe that I slightly adapted from King Arthur Flour. If you are feeling like rewarding your tastebuds with joy, I suggest giving this little number a go. Preheat the oven to 375°F. Lightly grease a 9×13″ baking dish. To make the topping: Melt the butter, and mix with the brown sugar, cinnamon, and ginger. Spoon the mixture into the prepared pan. To make the cake: Beat the butter and sugar until fairly smooth. Beat in the egg, then the salt, baking powder, vanilla, and coconut flavor. Add the flour alternately with the milk, mixing at medium speed and beginning and ending with the flour. Once the last of the flour is added, mix briefly, just until smooth. Spoon the thick batter into the prepared pan, spreading it to the edges of the pan. Remove the cake from the oven, wait 3 minutes, then turn the pan over onto a serving plate (You’ll need a big one for this size of dish). Wait 30 seconds, then lift the pan off. If anything sticks in the pan, just lift it out and place it back on the cake.